You are here: Home / Loving Nature / Basking Sharks & Sea Eagles..
Basking Sharks & Sea Eagles.. I have started listening to that long-standing radio soap-opera, The Archers… yes, I know, something hard to confess to, but once you do, you’ll be surprised how many other people do too! Anyway, I always play it on my iPad when I go to bed to help me get off to sleep and because it’s on BBC iPlayer, the programme always starts and ends with the little bit that tells you what the next programme is about. Last night, it was something that really sparked my interest and here is a bit of what it was about. An unlikely trio, all soccer fans (Chelsea and Manchester United), broadcaster Marc Riley, rock musician Damon Albarn and filmmaker Ceri Levy, fell into an interest in nature and wildlife as children. Now they had been brought together by the idea of going “In Search of the Holy Tail”. Basking Shark are found mostly in temperate waters, and are the second largest fish after the Whale Shark – about the size of a double-decker bus. They are so-called because they love to bask in the sun – don’t we all! This creature has tiny teeth (unlike it’s cousins) and its favourite food is zooplankton – tiny sea animals that live near the surface of the water. The shark trawls with his huge mouth wide open, and the food is sifted by its gill rakers, which, because they work so hard, are replaced annually during the winter months. In the UK these great creatures can be seen from places like Cornwall and in Scotland, especially around the Isle of Mull. Mull is inhabited by about 3000 people and around 250 species of wildlife! 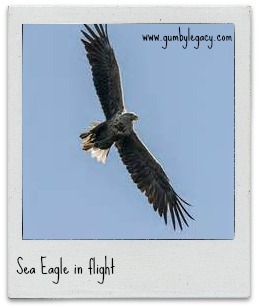 Apart from the Basking Shark, Mull is now home to another tailed creature, the Sea Eagle. These relatively docile birds (compared to it’s neighbour on the isle, the smaller bodied Golden Eagle), with a wing span of over 8 feet, became extinct in the region around 1900. They were reintroduced to the area from Norway by the RSPB and now have a number of successful breeding pairs. These spectacular birds have learnt to co-exist. Even though the Golden Eagle is the smaller of the two, they are more aggressive than the White Tailed Sea Eagle and dominate over them. On their trip, Mark, Damon and Ceri first practised their snorkelling whilst swimming with seals – the highlight of the trip for one, who found the curiosity of the seals remarkable and was left wondering who was watching who! More than 50 sharks! Once out into open waters to look for sharks, the super clear water with clean white sand below, not uncommon around the more remote coastlines of Scotland, with the swaying kelp forest below, the algae and the feeling of the cold, cold water, despite wearing wet suits and all the gear, was rewarded by seeing this magnificent fish breaching the water and being able to see about 50 of them all around them. This was the Opportunity of a Lifetime, which left them all with a sense of wonder, achievement and a strong commitment to seek more adventures in the wild to explore the nature of our world. I, for one, am planning a trip to Mull next year to see their wonders for myself! For more information on ‘The Search of the Holy Tail” visit the Radio 4 website and hear the broadcast by Smooth Operations Productions for yourself. www.baskingsharksscotland.co.uk for more information about trips to see these amazing creatures as well as photos and really super video of their tour experience. 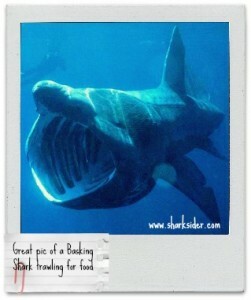 www.sharksider.com for lots of interesting facts and free e-book with info about sharks. www.mullcharters.com for more about what the Isle of Mull has to offer.